Here is a picture of them as they were drying... 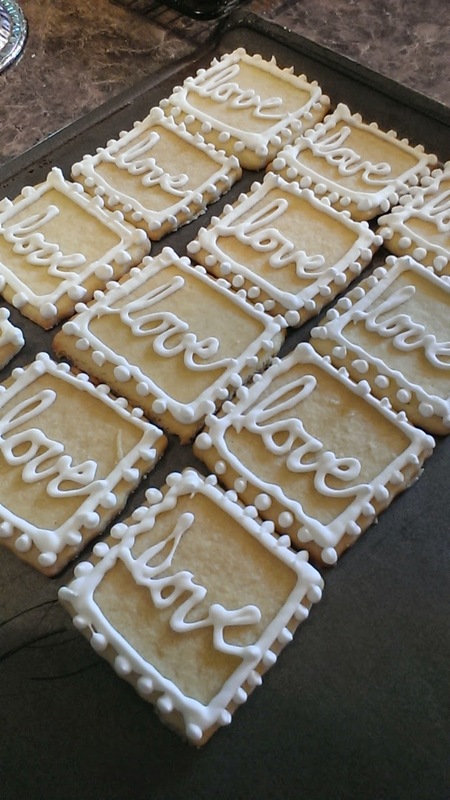 I packaged up the 50 cookies in cellophane bags with a cute sticker and sent them over. My friend was thrilled and said they were a hit!! It's been a busy week with birthdays, Fathers Day and little trips here and there. I'm completely in between big sewing projects. I'm kind of enjoying the break. I'm working on organizing Grammie Camp activities and gathering supplies. I showed you last week, a wallet that I made myself. Well, that was a prototype, and I have loved using it over the past couple of weeks. 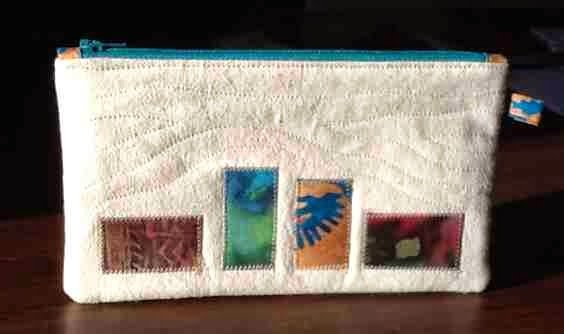 I decided to cut out a couple of kits to make two more, and I would choose my permanent wallet after they were done. 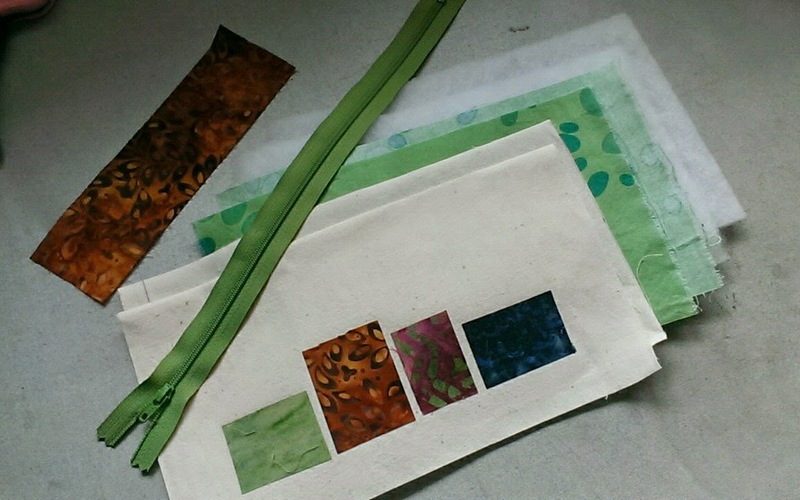 Well just about that time, I was visiting Diane at Country Crafts, and came home with beautiful leafy batiks to make wallets. So I cut out two more kits. So now I have four wallet kits cut out. I decided to make them all at the same time. I did a little bit here and there in between our little trips, and wow, I have my four wallets done. This is such a nice pattern that I might lead a private workshop locally. I would call this a slightly advanced project. This would definitely be for a confident sewer. That doesn't mean that a non-confident sewer can't do it. Just buddy up with a confident sewer who can quietly watch over you... Let me know if you are interested. I still don't know which one I will take as my permanent wallet. I'll decide next week. That would be time to start working on my Block of the Month from "The Quilt Show". I've been waiting until a week or two into the month before working on the blocks. There have been some great suggestions posted on the BOM forum by keeners who do the blocks within a few days of the release of the monthly pattern. This month was no exception. I took the time to cut out all the pieces required for the N, O, P and R blocks. It took me a while to find all the right colors. It's easy to get mixed up. Ask me how I know. I'll do a block a day next week. After sashing these 4 blocks, they will be added to last months blocks and the middle section will be complete. Friggy as it is, I'm really enjoying this BOM. 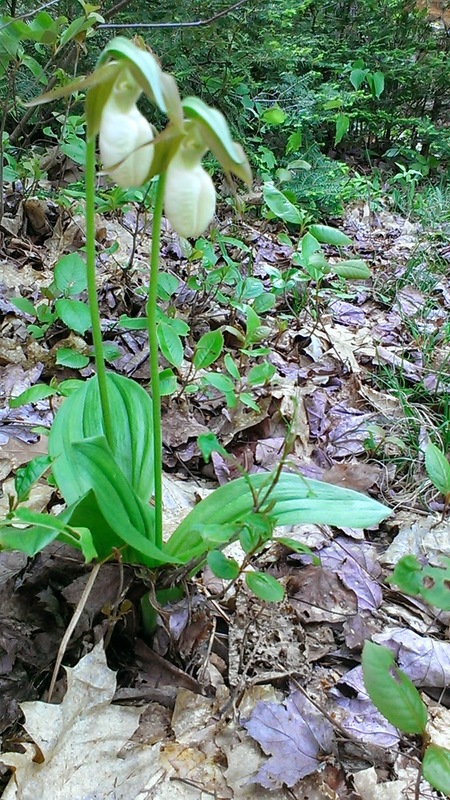 It's lady slipper time at the cottage. Always around the first of June, the blooms lift up from the leafy ground. Last weekend, I counted 15 blooms of which three are white. The rest are pink. I can't wait to see how many more pop up this week. My blooms count seem to be increasing every year. I hope this weekend, my count is in the high twenties. Some time ago, my sister found a great deal on these vintage Tupperware spice containers at a yard sale. She couldn't leave without them. She didn't need them because she has some of the same, but a newer color. But I could sure use them. She gave them to me I was thrilled. 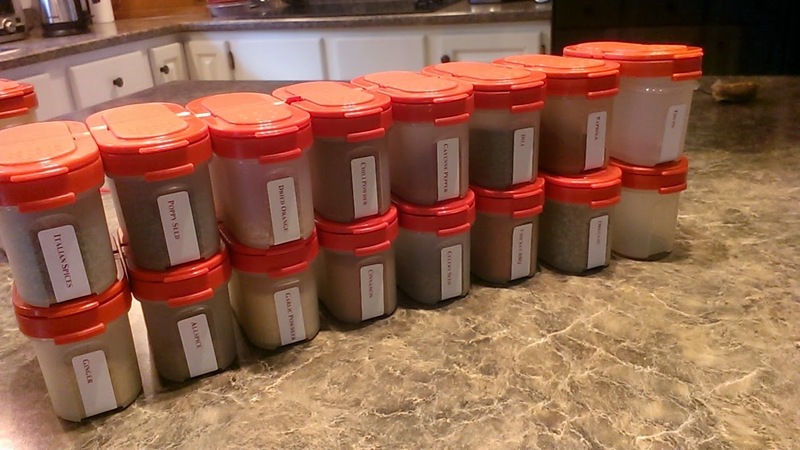 I had fun buying all new spices for them, and making tiny labels. I'll use them at the cottage in the summer, then in the winter, I'll take them to Florida in the winter. As you probably know, the Stan Cassidy Center here in Fredericton does amazing work. It's a world known re-hab center for those with physical disabilities and serves the whole province of New Brunswick. This week, I've been featured as a volunteer on the blog of the Stan Cassidy Foundation website. I'm honored. I'm not a regular volunteer, or even a BIG volunteer. I quietly sit in the background and help where I can. I'll tell you a little story of how I really appreciated the center's help a couple of years ago. When grand-daughter Aurora was only 3, she fell in the playground and broke her foot. She was laid up. Because she was so small, and wasn't mobile, she could not go to day-care. Her mother needed to work, so Aurora came to stay with me for a few days while we figured all this out. She had to be carried everywhere. Well my friend, Kathy put me in contact with the Stan Cassidy Center where I arranged to borrow a child size walker. She was fitted and we came home with a now mobile kid. (I blogged about it here in 2011). We were all so relieved. Within a day, she went back to day-care, with her walker and was the hit. I was so pleased that the Stan Cassidy center was here and so uncomplicated. Would you go read the Stan Cassidy blog article and leave a comment on their blog to tell us if you have been helped by the center in a small or big way. (They love comments). Does Red Fabric Scare You? It's time to think about what quilt I will make for the St. Dunstan's quilters raffle quilt this year. They like big blocks, they like lots of light or white because it shows off the quilting. I haven't done a red and white quilt for them for about 13 or 14 years... and that would have been the first quilt I ever made for them. 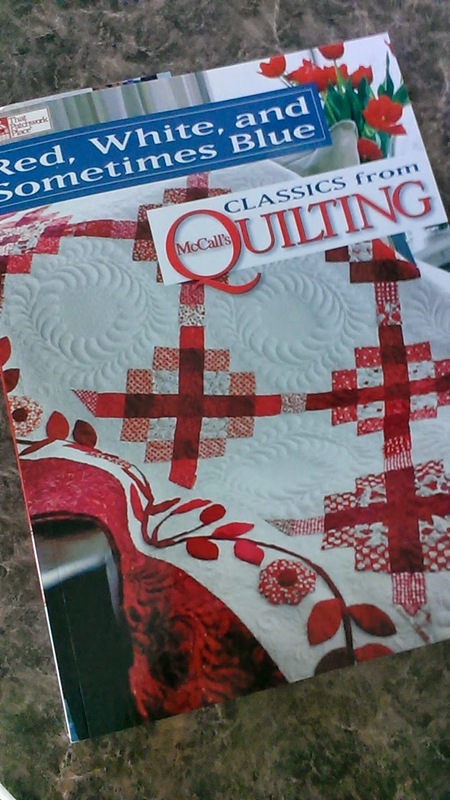 I thought this cover quilt from this Classics from McCall's book would be perfect. Fun for me to sew and also so traditional and elegant for these quilters to quilt. So it's time to start the hunt for reds. My mission over the next month is to collect a variety of reds for this quilt. Knowing that red fabrics bleed, I'll take precautions to pre-treat these fabrics so they don't bleed. What I don't know, is if one pre-treatment is enough? I thought I'd show you a little project that we did at the Pfaff Club today. Pfaff Club is intended to build skills with our Pfaff sewing machines. It is usually put on by a Pfaff Dealer but we don't have one in our city. So a few of the Pfaff owners asked if I would help them out. How to prepare a zipper for a clean neat finish by enclosing the two ends. Of course, this meant cutting both ends of the zipper. We used our built in walking foot (IDT) to zigzag applique on the batik pieces. We learned to test your stitches before sewing. Not all Pfaff stitch numbers are the same. We engaged the IDT to sew/quilt curvy lines above the batik patches and on the back. 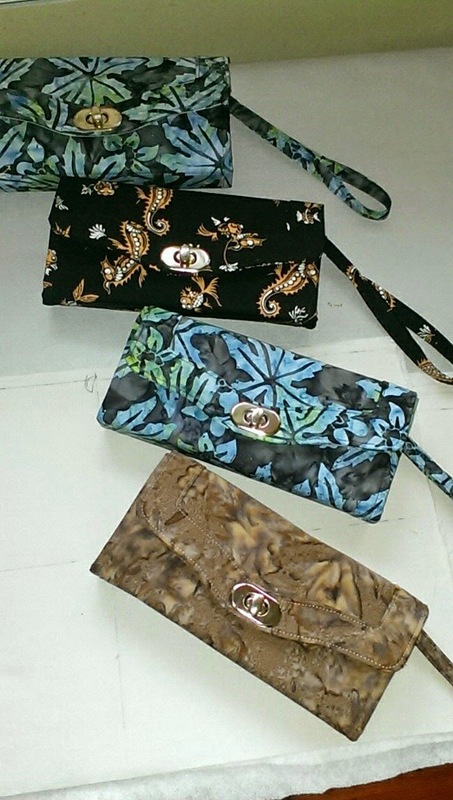 We used our quarter inch foot to sew the 1/8th inch top stitching detail at the top of the pouch, near the zipper. We used the quarter inch foot to sew the quarter inch seams. And we used the zigzag to finish off the seams inside the pouch. Lucy B. 's Zippered Pouch Perfect. Lots of skill building in this small project. And just look at how neat this zipper looks. Thanks Lucy B. for sending me this picture. 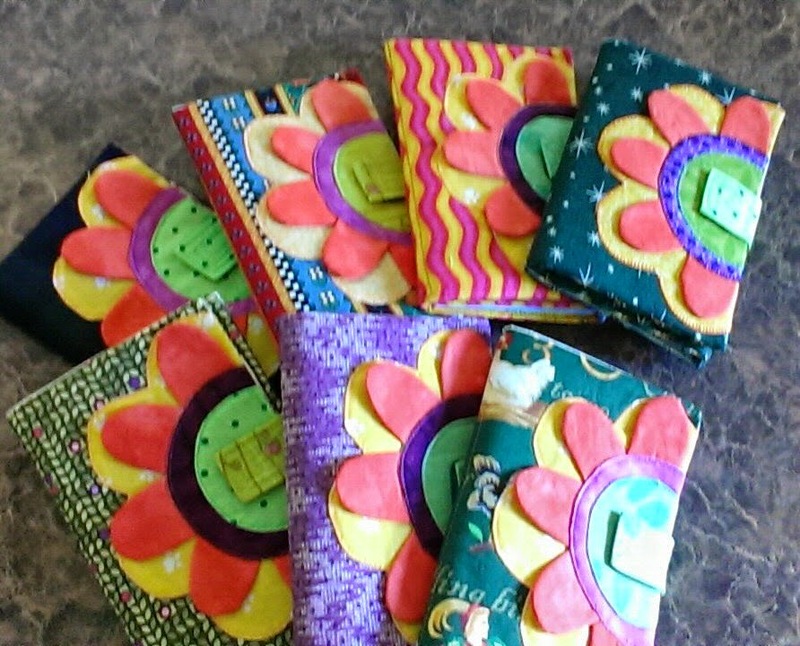 Even with the nice weather, I managed to finish off these seven posy wallets over the weekend. 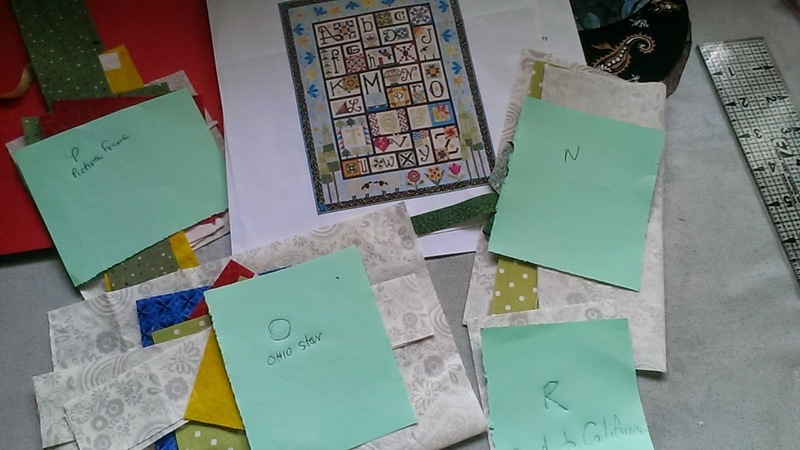 Four will go to some new hand-quilters at St. Anthony's. Two more will be sold in our guilds silent-auction fund raiser on Monday, and the extra will be in my sewing room to use an an emergency gift. And we did get the garden all done too. I have the black-fly bites to prove it! The garden looks fabulous. I had a pasque flowering already, and the lilies are full of foliage, and within a couple of weeks, I bet we see flowers. Ahh, I love these sunny days.